From Springfield/Northampton: Take I-91 North to Exit 22. Go straight off the ramp onto Route 5-10 North. Take your second right onto Depot Road. Follow Depot Road all the way to the end. At the end take a left onto Main Street. Skawski Farms is 0.1 mile on your left. From Greenfield: Take I-91 South to Exit 23. Take a left off of the ramp onto Route 5-10 South. Take your second left onto Depot Road. Follow Depot Road all the way to the end. Turn left onto Main Street and go 0.1 mile. Skawski Farms will be on your left. From Amherst/Hadley: Take Route 116 North to the Sunderland Bridge. Go over the Sunderland Bridge and take your first left onto River Road. Follow River Road to the Hatfield/Whately town line. 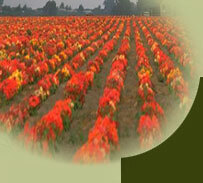 Skawski Farms is 0.7 mile on your right from the town line. 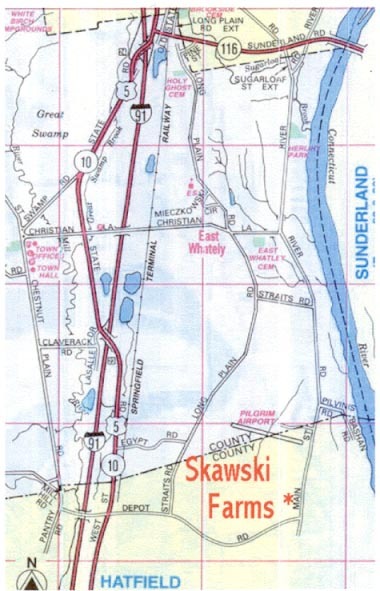 Skawski Farms is located at 455 Main Street in Hatfield, MA. Our Telephone Number is (413) 247-9484.